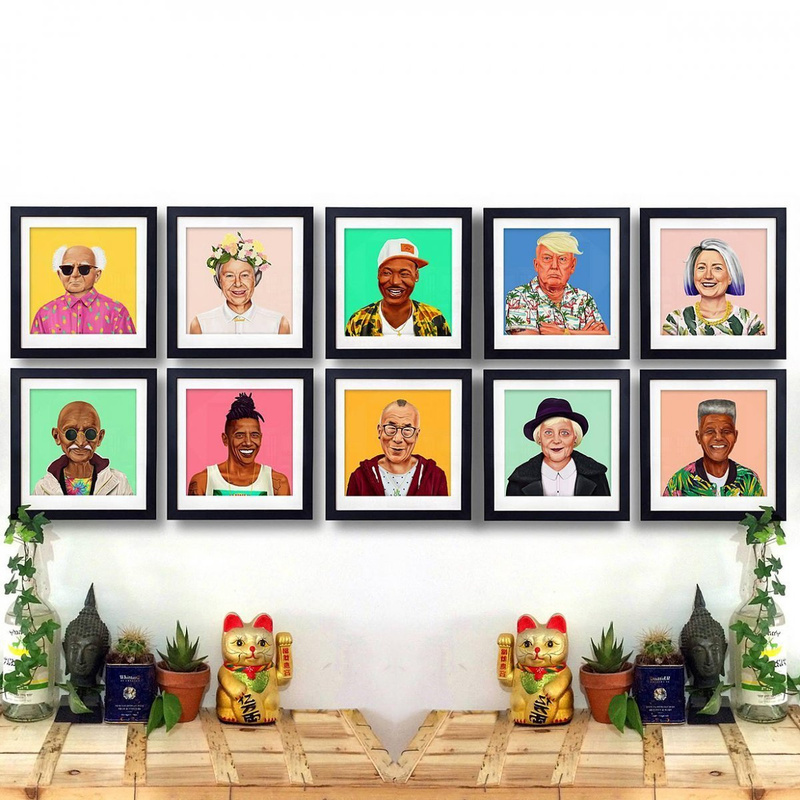 The framed print of Martin Luther King is part of a series of caricatures known as Hipstory, made by Israeli illustrator Amith Shimoni for Fisura. 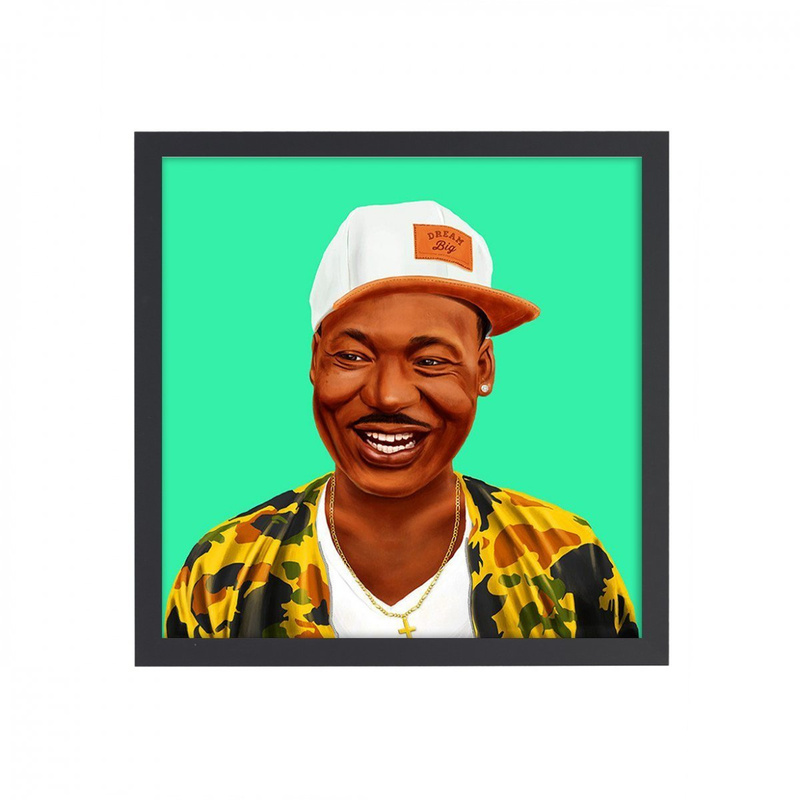 This 80x80 cm print on 300-gram paper is equipped with a frame and lets you admire the famous equal rights pioneer in an original fashion. While we're used to seeing this leader in old-fashioned black and white prints, the first thing that will strike your attention is actually the colours used. Martin Luther King is shown with a "printed" smile on his face, emphasising pride in fighting so hard for equal rights. A determined, non-violent advocate of civil rights, Amith Shimoni chose to have him wear a modern, stylish jacket. As a nod to his pacifist ways and Baptist roots is the cross around his neck, a piece often used by new generations simply as a way to stick to the trends, also shown in his on-trend clothing and bright earring, pieces that the illustrator wanted to show off in the painting while also searching for consistencies in both the interior and exterior. On the framed print, Martin Luther King is wearing a sporty hat with "dream big" written on it, an obvious tribute to his most famous line of "I have a dream," declared in Washington at the end of a protest march promoting civil rights and expressing hope that one day all races would live together in unity and equality. His dream has in part come true, but Amith Shimoni puts some scepticism on it, showing the figure as someone constantly searching for himself, followed by the masses through imitation of famous figures based solely on appearance, as their actual personalities are ignored in favour of fashionable accessories. The print fits well with any part of the house and is also a great gift idea. Fisura interprets contemporary design through dynamism. Fisura products are inspired by experiences: travels, collaborations and a team full of people with different backgrounds. Vitality and energy of young professionals are perfectly combined with the 30-year experience in the field, in order to guarantee high-quality products.